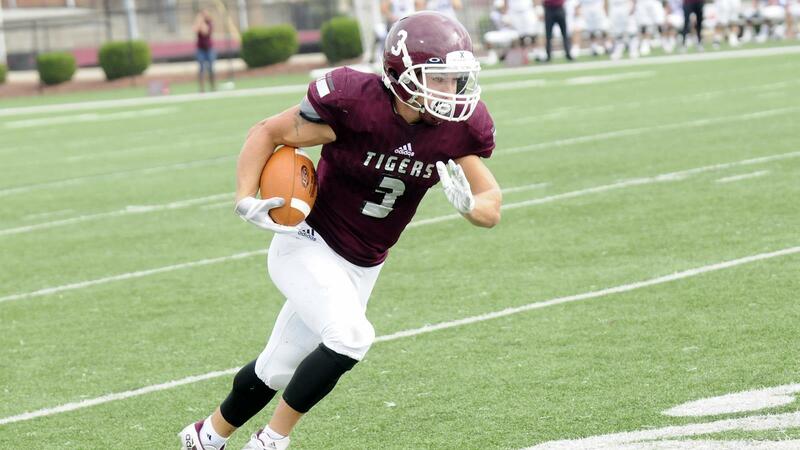 Young completed his sophomore with 64 catches for 805 yards to lead the Tigers. He also hauled in the second-most touchdowns with nine, had a long TD catch of 75 yards and averaged 89 receiving yards per game. Young finished his sophomore season with two double-digit-catch games – 11 vs. Bethel University for 200 yards and 10 vs. Cumberland University for 185 yards. He also hauled in single-game high three touchdowns vs. Cumberland and two apiece vs. Cincinnati Christian and Ave Maria. Named First Team All-MSC Bluegrass Division. Played in nine games and started eight of them. Finished with 63 receptions for 798 yards and nine touchdowns. Ran the ball 28 times for 105 yards and two touchdowns. Went 1-1 for eight yards passing. Had one kick return for 11 yards. Finished third on the team in receptions with 35. He compiled 305 receiving yards and touchdown. Young also ran the ball 15 times for 31 yards and touchdown. During his freshman season, Young played in 10 games and caught nine passes for 147 yards and touchdown. He also ran the ball 24 times for 154 yards. I want people to know that I was a special player and left it all out there. I want to prove people wrong who over looked me and to continue a brotherhood that is made. Making plays through contact, or holding on to a catch after a big hit. Physical, Knowledge of the game, and a great work ethic. Ryan Switzer or Tavon Austin because not the biggest players on the field, but make plays and hard to guard. Heart, no matter the situation I will give it my all and make plays. If you can play alongside any athlete in the NFL, past or prestent, who would it be and why? Antonio Brown, favorite player and just being able to play and learn from him would be a great experience. My mother, she’s the hardest working person I know and will do anything for our family. Success is when you set a goal and achieve it. I was born with a birth defect and only have one lung.